Last month, I shared some of my favorite hemp seed pesto recipes. 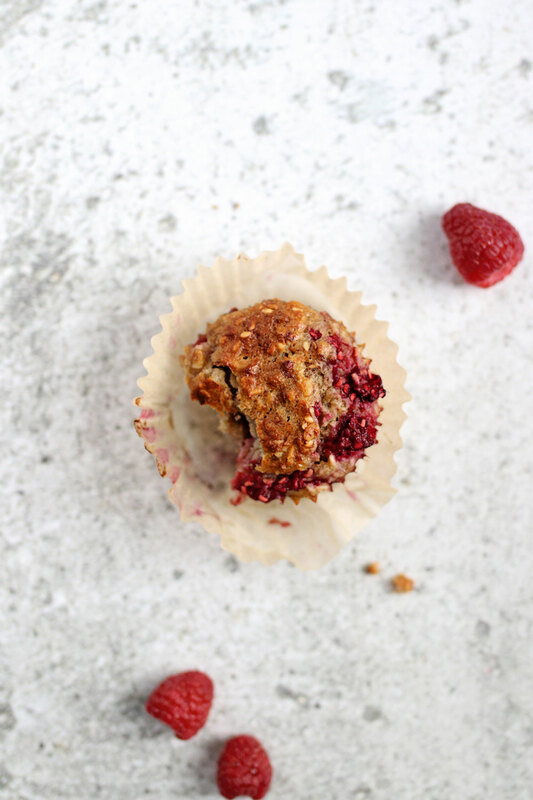 But if you’ve got a big bag of hemp seeds sitting in the pantry and you’re not exactly sure how to use them, here’s one of my other favorites: Hemp Muffins. 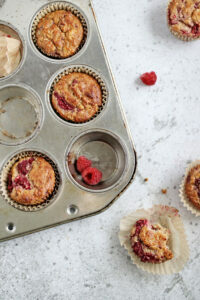 Really, these are more like everything muffins: they’re made with two different kids of fruit (raspberries and bananas! ), oats, Greek yogurt, honey, and, of course, those protein-packed hemp seeds. They’re tender, sweet, and satisfying in a way that muffins usually aren’t. We keep some variation of these muffins in the freezer at all times because my 3-year-old loves having them for breakfast. Depending on what’s in season, we might add strawberries, blueberries, diced peaches or apples instead of the raspberries–or, if it’s the time of year when nothing’s quite in season, frozen fruit works too. 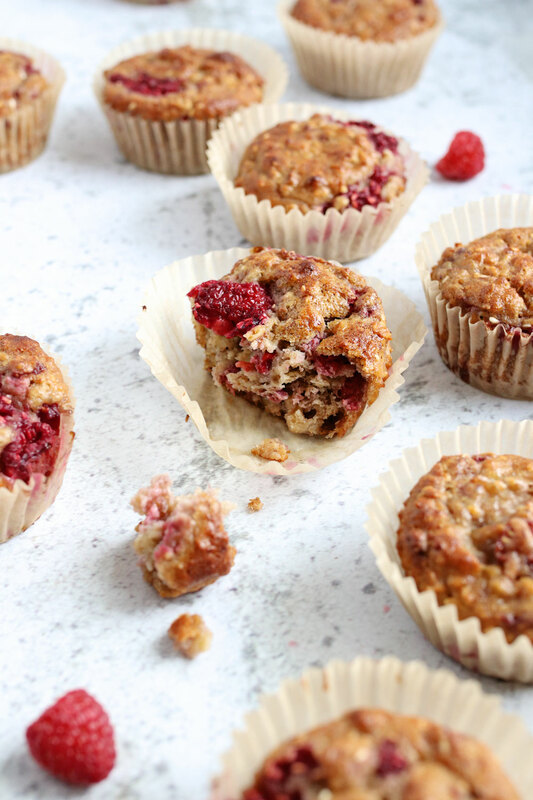 Each muffin has 6 grams of protein, which isn’t huge, but it’s definitely a step up from a typical muffin which doesn’t pack much staying power. Cut it in half and slather on a tablespoon of almond butter to add a little extra protein for a super quick breakfast. Sweetened only with honey, these muffins are a great breakfast with a smear of almond butter. Preheat oven to 400ºF. Line a muffin tin with 12 paper liners. In a large bowl, whisk together the flours, baking powder, baking soda and salt. Stir together the oats and yogurt until well-combined in a second bowl. Stir in the banana, honey, oil, and egg. Pour the wet mixture into the flour mixture. Stir until moistened, careful not to overmix. 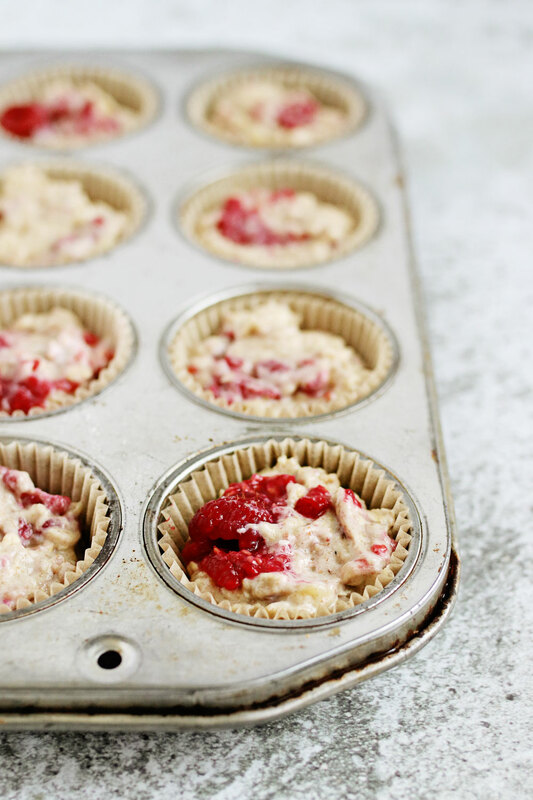 Fold in the raspberries and hemp seeds. Divide the batter evenly into the paper liners. Bake for about 20 minutes or until a toothpick inserted into the center of a muffin comes out clean. Cool on a rack for 5 minutes, then remove the muffins from the muffin tin and return them to the rack for another 15-20 minutes or until cooled completely.